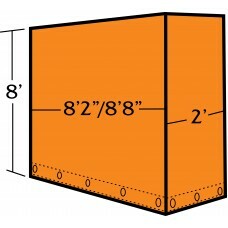 We stock a 8’2”W X 8’H X 2’L for a 96”W trailer in 18 OZ Black Vinyl with grommets on the hem. Custom sizes and colors available. 8'2"W X 8'H X 2'L Nose/Smoke Tarp 18Oz Black - 96"W Trailer Grommets on the bottom and side hems. C..